Teaching English Language at schools and universities since 1995 and working as a school principle for four years and as an English Language supervisor for ten years, the author of the paper noticed that majority of teachers adopt traditional ways of teaching English as a foreign language (EFL) learners. In these classes teachers inculcate knowledge through spoon feeding practices rather than innovative ones that may challenge students' thoughts and abilities by facing them with non-traditional events, activities or scenes.  In spite of the fact that Muslim teachers recite many verses from the Holy Quran daily, they are unaware of the pedagogical and psychological implements in the verses they have been reciting. 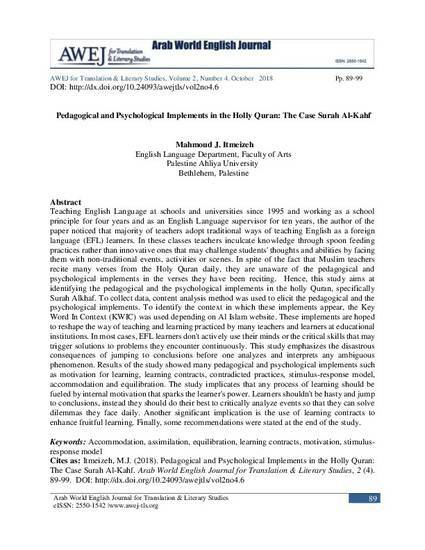 Hence, this study aims at identifying the pedagogical and the psychological implements in the holly Quran, specifically Surah Alkhaf. To collect data, content analysis method was used to elicit the pedagogical and the psychological implements. To identify the context in which these implements appear, the Key Word In Context (KWIC) was used depending on Al Islam website. These implements are hoped to reshape the way of teaching and learning practiced by many teachers and learners at educational institutions. In most cases, EFL learners don't actively use their minds or the critical skills that may trigger solutions to problems they encounter continuously. This study emphasizes the disastrous consequences of jumping to conclusions before one analyzes and interprets any ambiguous phenomenon. Results of the study showed many pedagogical and psychological implements such as motivation for learning, learning contracts, contradicted practices, stimulus-response model, accommodation and equilibration. The study implicates that any process of learning should be fueled by internal motivation that sparks the learner's power. Learners shouldn't be hasty and jump to conclusions, instead they should do their best to critically analyze events so that they can solve dilemmas they face daily. Another significant implication is the use of learning contracts to enhance fruitful learning. Finally, some recommendations were stated at the end of the study.